A U.S. Customs and Border Patrol agent has been arrested on the suspicion he murdered four people and kidnapped a fifth person. Juan David Ortiz, 35, was arrested in Laredo and faces charges of murder and aggravated kidnapping. Webb County District Attorney Isidro Alaniz said authorities were dealing with a “serial killer” because the manner in which the four victims were killed was very similar. Authorities did not provide details on any of the victims. Ortiz was arrested early Saturday morning at a hotel. A kidnapping victim had escaped and alerted police. 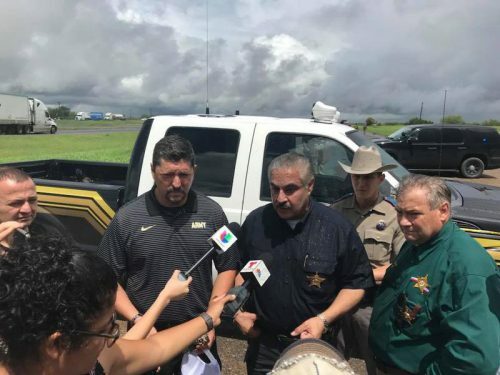 “Our Webb County Sheriff’s Office team of investigators, together with the Department of Public Safety, the Texas Rangers and the district attorney’s office, have been working diligently on this case. It was because of this teamwork that we were able to detain the suspect,” he said, adding that the investigation is continuing. Ortiz has been with Customs and Border Protection for 10 years. A statement from CBP said he’s a supervisor with the agency. Laredo is about 150 miles south of San Antonio and sits on the Texas-Mexico Border. Cuellar said a news conference with more information is expected to be held on Monday.